At one golf course, there were multiple water hazards. KAUAI (HawaiiNewsNow) - Unrelenting rains on Kauai through the weekend led to flooding at Koloa Camp and dangerous conditions on roadways. At last check, Kuhio Highway remained shut down near Hanalei Bridge and near Haena Beach Park. The amount of water that was gushing at Wailua Falls left observers in awe. "Now that is pretty heavy," an observer remarked. Tourists and locals alike arrived in rain gear to catch the spectacle, with the weather putting a damper on other plans. "We came 7,000 miles to hike on the Na Pali Coast," Bill Cobb, visitor from Pennsylvania, said. "We just got there and it's closed. The road's closed. The valley is totally underwater. You could raise rice down there. It looks like a rice paddy." A man who has lived in Koloa Camp for three decades says he and his neighbors have been through numerous floods, but Sunday's may have been the worst. Camp residents woke up to thunder and lightning at about 4 AM. They say in a one-hour period, the water level at the nearby stream had risen six feet. "We kind of knew that the river or the stream, which is called Waihohonu Stream, hadn't been cleaned in a long time, so we were expecting some sort of flood," Kepa Kruse, Koloa Camp resident, said. "But we weren't really prepared for what was in store." The American Red Cross opened an emergency shelter at Koloa Neighborhood Center for evacuees, but closed it at 6 PM because no one came. Kauai police were forced to shut down several roads due to flooding. State and county crews scrambled to remove debris after a landslide on Kuhio Highway in Lumahai. "We have the moisture down low, the instability aloft," Tom Birchard, National Weather Service, said. "Then with that wind flow interacting with the terrain of Kauai, all the ingredients are there for what you might call the perfect storm, but definitely for prolonged heavy rainfall." 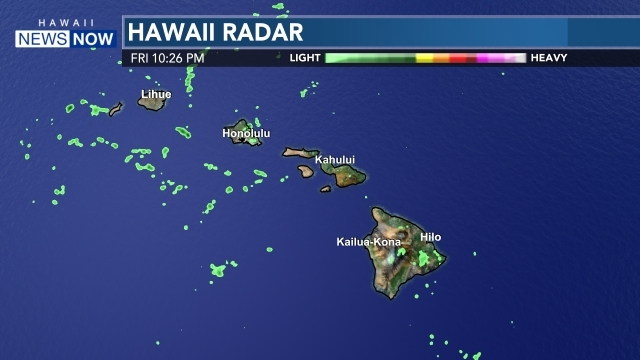 Meantime, a Flash Flood Watch is in effect for the entire island of Kauai, Niihau and Oahu until 6 PM Monday. Follow the storm with our Interactive Radar Map.